Players reported having issues with the latest patch. Update: Funcom issued a hotfix yesterday that includes a whole bunch of general bug fixes. Check out the details on Steam here. 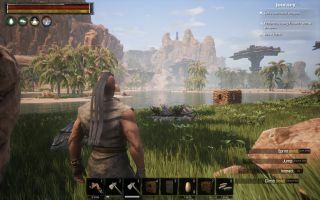 Funcom's latest Conan Exiles patch is now live, but it's apparently causing issues for some players. All the tweaks and improvements for the latest patch—snappily entitled patch 102943/18618—have been detailed on Steam by community manager, Natascha. "Are you ready for this wall of text? If not, well it’s your fault really," writes Natascha. "You asked for it and we delivered. You totally rallied to the cause as we saw the TestServer fill up quickly with hundreds of you playing. A real sight to behold!" Though 900+ players helped stress test the numerous fixes and updates—which include clan hierarchy, better threat animations from wildlife, and detrimental status effect icons above enemy target health bars—some are now reporting the game has been unplayable since the patch went live. "The game is TOTALLY UNPLAYABLE", says one commenter. "Thats unfair to setup such a big patches on weekend. Before this "glorious" patch i have bugs but I CAN PLAY THE GAME. At this moment all mechanics are broken. I've [sic] done. Thank you!" "Fixed bugs?? tell that someone else than the players!!" says another. "u fixed NOTHING! all what u did is bring us more bugs and make this game unplayable!" For the full patch list—which is very, very long—head on over to the Steam community page. We gave Conan Exiles a 65 in our review, stating it is: "Broad in shoulder, wide in scope, rough around the edges. Nevertheless, an enjoyably meaty survival game."